Teaching yourself something you really don’t know much about is a very hard skill, if you really don’t have the willingness to achieve your goal. In “Literacy Behind Bars,” Malcolm X decided that the only way to build his knowledge was to open the dictionary, and write it page by page, and every day he learned more and more. I can relate to his story and his willingness and self-motivation to build his knowledge by picking up a simple book like the dictionary. In my case, I picked up the GED Book. Coming from a Hispanic culture, my parents wanted the best for me and my siblings. They wanted us to live a better life, and having a high school diploma or a GED would help us in the long run. My father only went to school until 5th grade, couldn’t read or write and was in and out of jail for most of my life. I remember him getting other inmates to write his letters to us and in every letter he closed it with “Love your dad and don’t follow my footsteps.” As for my mother, she barely spoke English – some would say she spoke Spanglish. Due to her inability of speaking proper English, she was limited to few jobs, and life was a little rough, but we made the best of it. She always recalls how her life was hard and that school was very important to her, but a little challenging with living in a barrio called Macana, in Guayanilla, Puerto Rico with a household of eighteen siblings, where the girls shared clothes, shoes and even took turns going to school, because my grandparents couldn’t afford to have them all attend school. And the boys never went to school because they had to help bring in the bread and maintain the house. She worked as a live-in nanny at the age of sixteen until she could afford to put herself in school again and in 1978 she went back to complete her high school diploma. Once she got her diploma, she saved up and bought herself a one way ticket to the city that never sleeps, New York City. She lived there for two years, then met my father and had three children. They worked hard to make sure we had the basic essentials in life and always taught us to plan ahead for our futures. Keeping this in mind, my parents saw things happening in the city that they would’ve never thought of and moved us to Perth Amboy, NJ in 1985. As far as I remember, living in Perth Amboy was better than living in the city. We were allowed to go outside a lot more often and my parents thought that it was a lot safer. The environment was the total opposite to living in the city. Amboy was quiet. The only things you heard were the church bells going off every hour and the sound of recess in the school yards during the day. The nights were calm and you barely saw people in the street. School was less crowded and most of the teachers cared about their students and their education. My mother always told us to stay in school and finish our studies if we didn’t want to end up with a job like hers, working a third shift at a luncheon company. As the years went by, I realized that the real reason for her advice was because she wanted us to know that it would help us to start our journey to becoming educated and be ready for “the real world,” which really meant that once we gained, “that piece of paper,” like I would say, we were ready for employment and to contribute to the household. My mother gave us everything we needed to reach that goal of a high school diploma. I made it to my second year of high school, and like every teenager I wanted to have my own things that my mother couldn’t give to me, so I decided to get a job. Balancing school and a part time job was okay until my job wanted to give me more hours, and more hours meant more money. Able to make more money, I would have the opportunity to help my mother with bills and still buy things I wanted, so I made the decision to drop out of high school. My mother was very disappointed with my choice, but she always gave us the benefit of the doubt. I worked for the a few years, until I wanted to move up in the company, but in order to move up I needed a high school diploma or a GED. I did research on the Adult Learning Center in my town Perth Amboy NJ. I found out that they provide students that dropped out ages sixteen and up with a free opportunity to go back to school and finish getting their diplomas. I became determined to move forward in my job. I signed up for night GED classes. Classes were held at the old Barrack St. building which is now the Board of Education. The classroom was very out dated and nothing was ever in the same place. If you forgot something, consider it lost. I will never forget my teacher, Mrs. V; she was an older Philippine woman with dark brown hair and narrow eyes. She spoke with a heavy accent and always had to repeat herself. Mrs. V was a tough cookie to keep happy. She always complained about this one being late, and that one being loud. She was one of those teachers stuck in her ways. She always said “if you don’t apply yourself, I can’t help you.” I worked eight hours a day, and went to school three hours at night every day, then to go to class to hear her argue with other student’s that either didn’t understand what she said or were very disrespectful to her by clowning around about her accent. Mrs. V had a class that 10% wanted to be there to get their diplomas and 80% was there because they got kicked out of the high school and their parents enrolled them forcefully. The other 10% was ordered by the court system through a juvenile program. Mrs. V was tired of having to come to teach a class where the majority of the class just didn’t care, so she started not to care either. After four months, I saw myself losing interest, and not wanting to continue my studies. I felt that I was not learning anything, and I was wasting time sitting in a classroom with a bunch of classmates that just wanted to fool around. They were wasting the teacher’s time as well as mine, so she would take attendance and would tell us to read a chapter, and do the comprehension at the end of every chapter, with no explanations to any lesson. I felt that just handing in homework, and being there didn’t help me at all. I do understand that the other classmates caused all this commotion for her to act this way, but I feel that no teacher should have given up on the 10% of her class that wanted to learn which included me. I switched over to morning classes to try to give it another chance and that interfered with my work schedule. I needed to decide whether to continue or just stop going to school again. My decision was that I wouldn’t give up on what I really wanted, and that meant working for my GED, but I thought of an idea, if the teacher was just giving us the work why not just do it at home at my own pace. I already had the GED book, a dictionary, and everything else I needed to start, so the next day, I went to the Adult Learning Center and withdrew from their classes. My counselor understood because I wasn’t the only one dropping the course. She wished me good luck, and handed me a list of dates when they offer the GED test. I studied and taught myself using the examples given in the textbook, and every day I learned new things. I also retaught myself a lot I already knew. I did the same routine every day after work until I believed I was ready to take this test. On August 25, 2005, I scheduled the test and put everything in god’s hands. It took me some time to finish, but I felt I did a good job overall. Now all that was left was to wait for the test results to come in the mail. I gave the mailman a week then I received “that piece of paper,” that says, I passed! I was happy and excited that I actually taught myself well and was able to pass that test. For me the importance of opening that GED book was not only important to me but to my mother. Without her pushing, and encouraging me to finish getting my GED, I don’t think that I would be doing what I’m doing today or even be the person I am. Her struggles in life only made her as strong as she raised us to be; from never giving up no matter what or how hard it was, to always finish the task at hand. It also taught me a great lesson that we’re our own best teacher. To build your knowledge every chance you get, just because you don’t know what it means doesn’t necessarily mean you can’t teach it to yourself. “That piece of paper,” was the biggest accomplishment at the time, and it opened many doors for me to focus on my career choice which is to be a Pre-K teacher. That first step is done now and I’m on to the next step, “That second piece of paper,” my degree in Early Childhood Education. Submitted for ENG 095 Essentials of College Writing, Fall 2014. Assignment: Literacy Narrative. Instructor: Kevin Lamkins, Associate Professor of English. Instructor comment: I loved this Literacy Narrative because of its rich detail and well-told story which combine to show the level of perseverance Norma had to educate herself. She also shows a connection to a reading from class. A fine example of the genre. 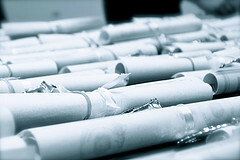 Photo credit: “Diplomas!” by Sergio Rivas, licensed through Creative Commons.